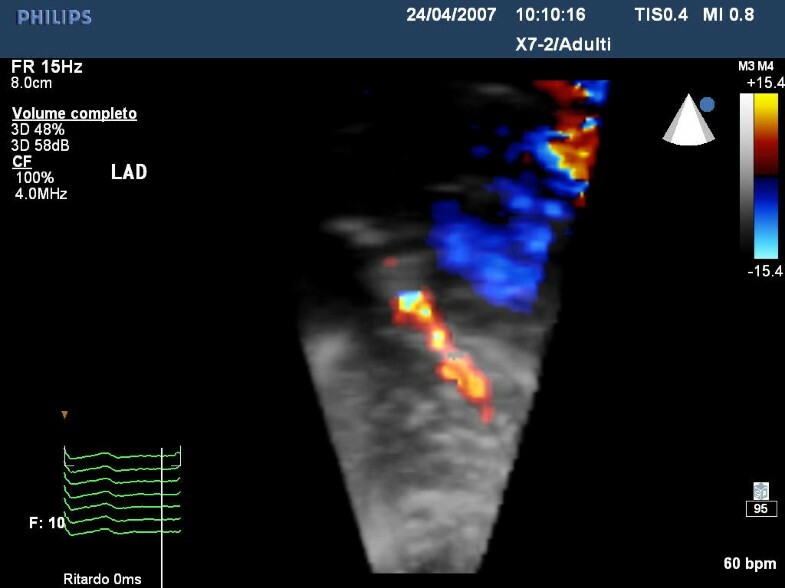 Coronary flow investigation by ultrasound: what can we get at present ? We will conclude by underlining that, nowadays, innovative technology allows complete evaluation of both major coronary arteries in many patients in a resting condition as well as during pharmacology stress-tests, but we often do not know it. The application of the latest ultrasound technology, in particular the 2nd harmonic, has opened new roads in ultrasound coronary evaluation. By applying anatomical knowledge and the newest technical applications it is nowadays possible to propose a complete coronary evaluation of the left anterior descending artery and of a part of the posterior descending coronary artery in clinical practice  [see Additional File 1]. 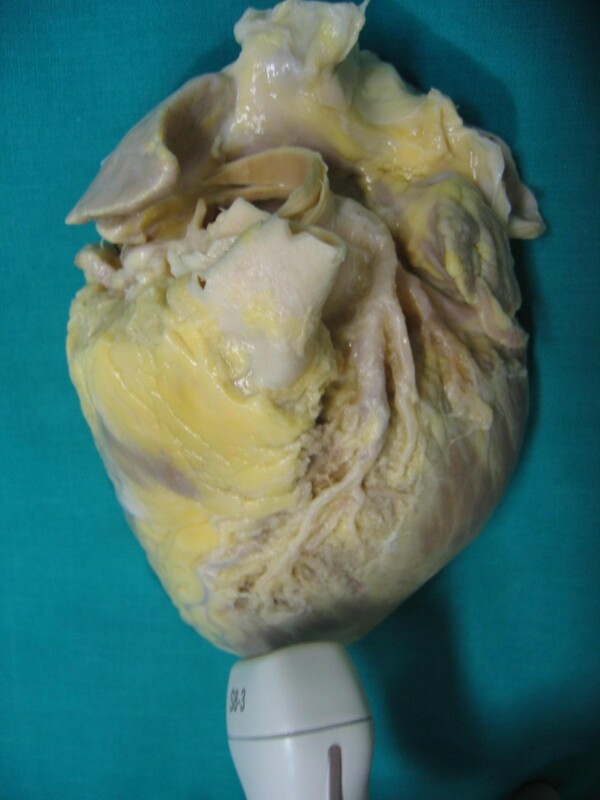 Left anterior descending (LAD) coronary anatomy was the first artery investigated with ultrasound by transesophageal and transthoracic approach. This vessel is visible by using ultrasound from proximal to distal tract and following key anatomical structures through the delivery of an ultrasound beam in an off-axis approach starting from the classical apical approach (Fig 1, 2). 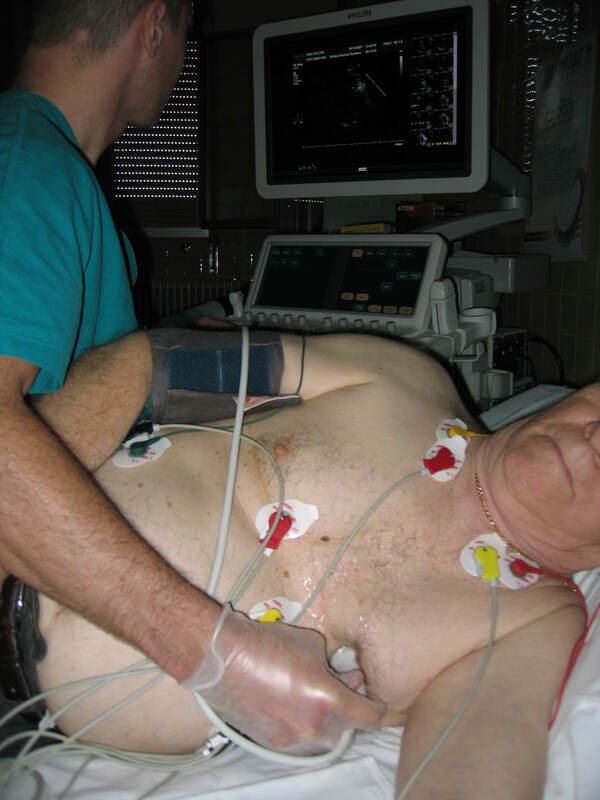 shows Transthoracic positioning of probe in order to highlight the two major coronary arteries while. represents an artist's drawing illustrating transducer beam orientations to the left anterior descending coronary artery (LAD) and to posterior descending coronary arteries with the corresponding echocardiographic images of the mid-distal tract of LAD Pulse-wave flow and posterior descending coronary artery (PDCA). 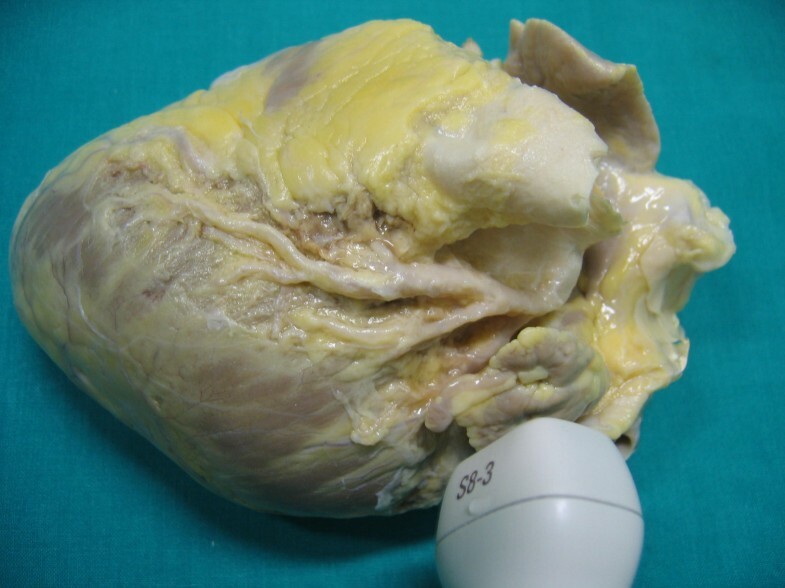 Proximal Lad: the left atrial appendage and pulmonary artery represent the key reference points in detecting the proximal left anterior descending coronary tract (Fig 3, 4, 5) [see Additional File 2]. 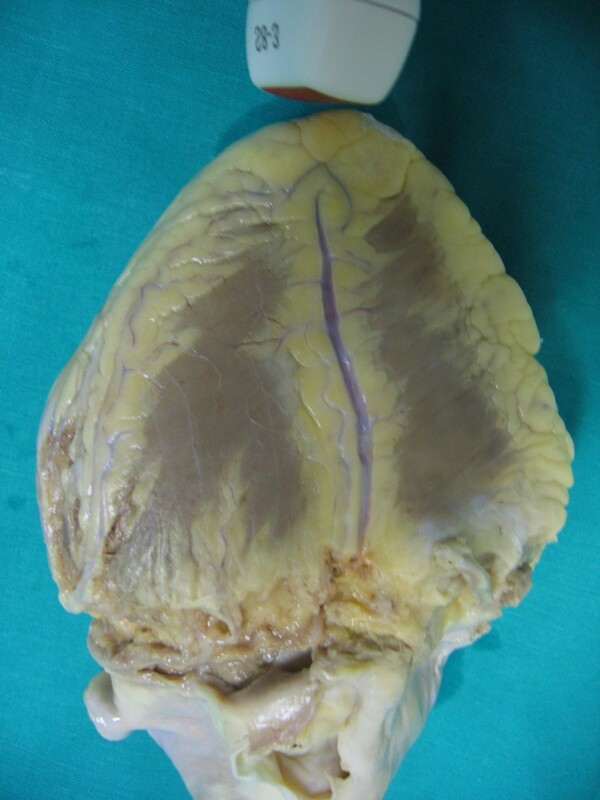 shows anatomical finding of proximal tract of Left anterior descending coronary artery (reference key are Aorta, Pulmonary artery and left atrial appendage). 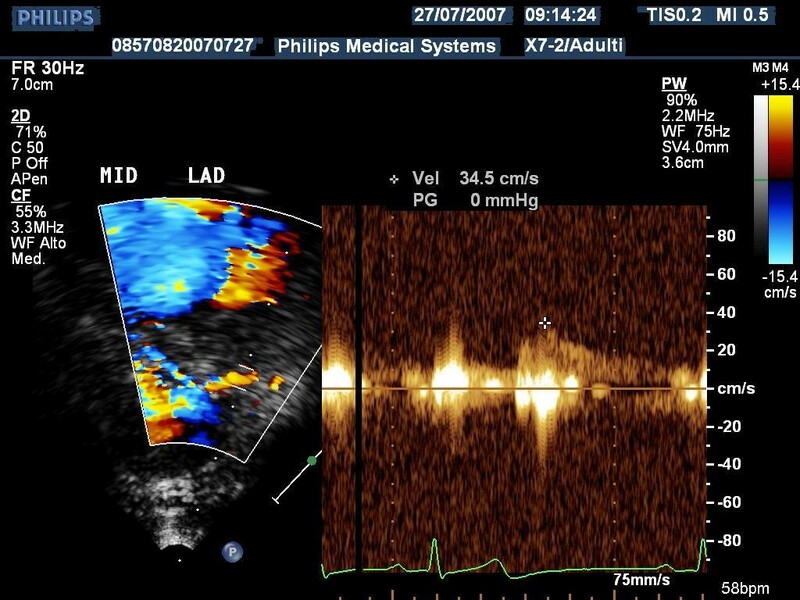 highlights the ultrasound findings of proximal left anterior highlighted with color-Doppler and. shows the pulse Doppler envelope of proximal tract of the left descending coronary artery. Intermediate Lad: the septal perforans branches represent the key references obtainable by angulating the probe slightly lower (3,5-5 MHz in 2nd) and maintaining the focus on the anterior interventricular sulcus (Fig 6, 7, 8) [see Additional File 3]. represents the anatomical findings of Intermediate tract of Left anterior descending coronary artery (reference keys are: the anterior interventricular Sulcus and Septal Branches). shows the ultrasound findings of proximal left anterior highlighted with color-Doppler. 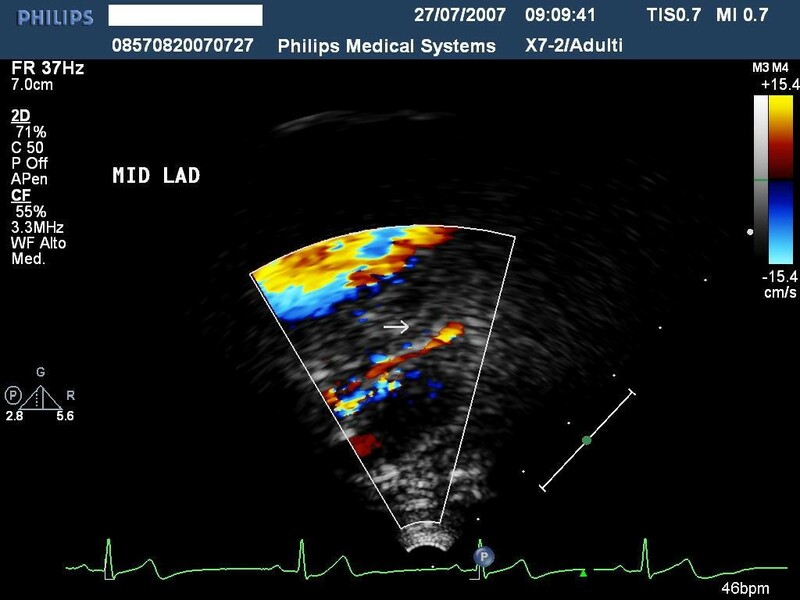 shows the Pulse Doppler envelope of mid tract of left descending coronary artery. Distal Lad tract: this can be highlighted by investigating the lower part of interventricular anterior sulcus near the apex under Color Doppler guidance and adopting growing delivery frequencies (5–7 Mhz in 2nd harmonic). 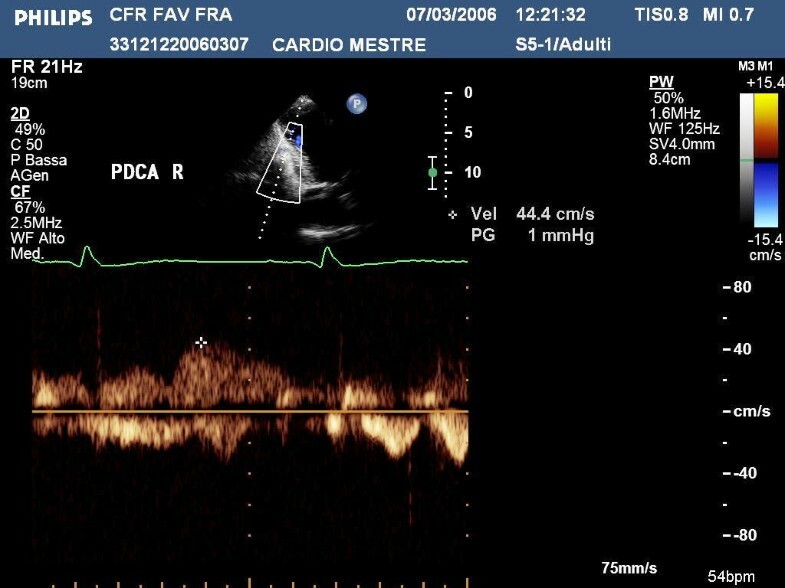 By subsequently applying Pulse Doppler inside the coronary vessel, we may obtain the coronary spectrum and therefore quantify it (Fig 9, 10, 11) [see Additional File 4]. shows the anatomical finding of distal tract of Left anterior descending coronary art (the reference keys are: distal tract of the anterior interventricular Sulcus and Septal Branches). 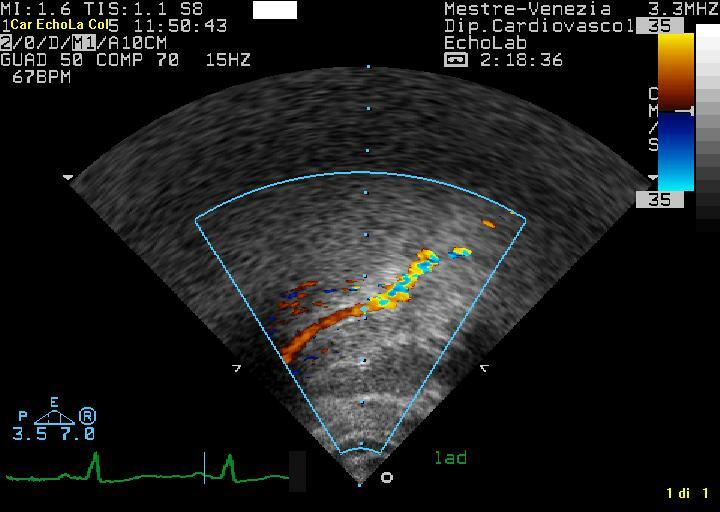 represents the Ultrasound findings of distal left anterior highlighted with color-Doppler. 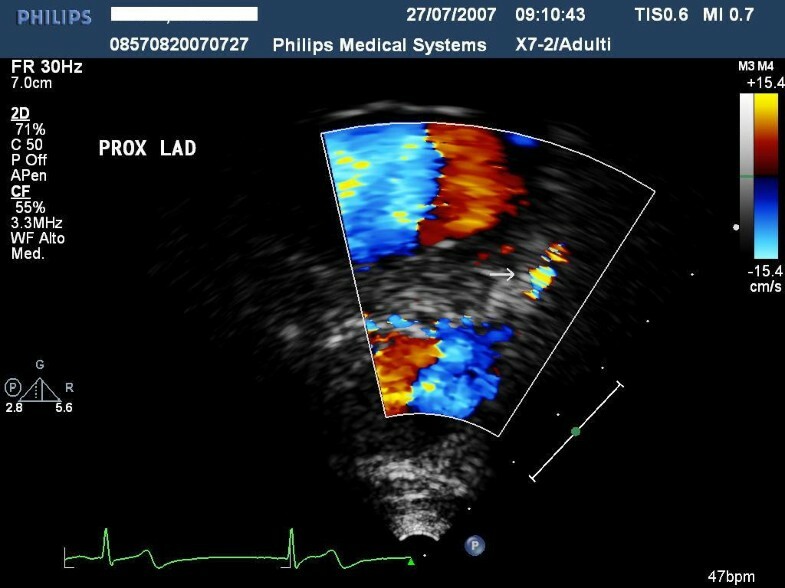 shows the Pulse Doppler envelope of distal tract of left descending coronary artery. 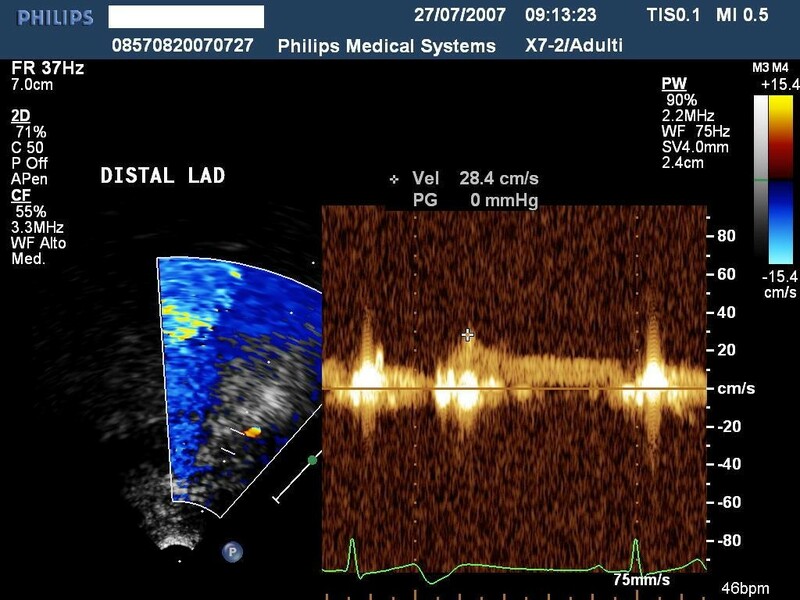 For the distal left posterior coronary artery we must address the ultrasound beam in a counter-clockwise direction (Fig 1b), and, always under Color Doppler guidance, focus the ultrasound beam on the posterior descending coronary sulcus (Fig. 12, 13, 14) [see Additional File 5]. shows the anatomical findings of distal tract of Left posterior descending coronary artery (reference keys are: distal tract of the posterior interventricular Sulcus and Septal Branches). 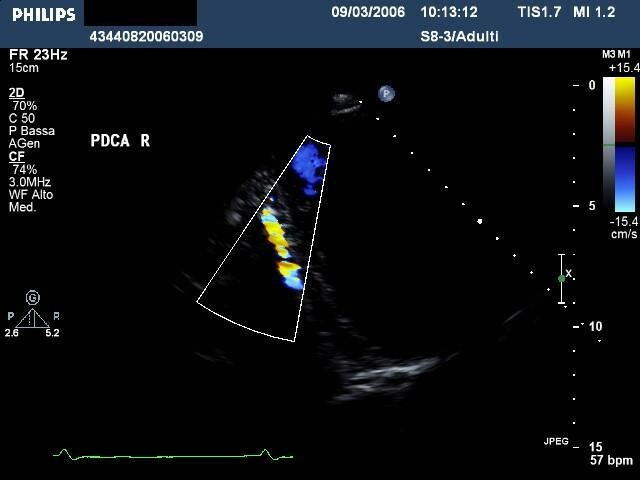 highlights the Ultrasound findings of distal left posterior descending coronary artery highlighted with Color-Doppler. shows the Pulse Doppler envelope of the distal tract of left posterior coronary artery. 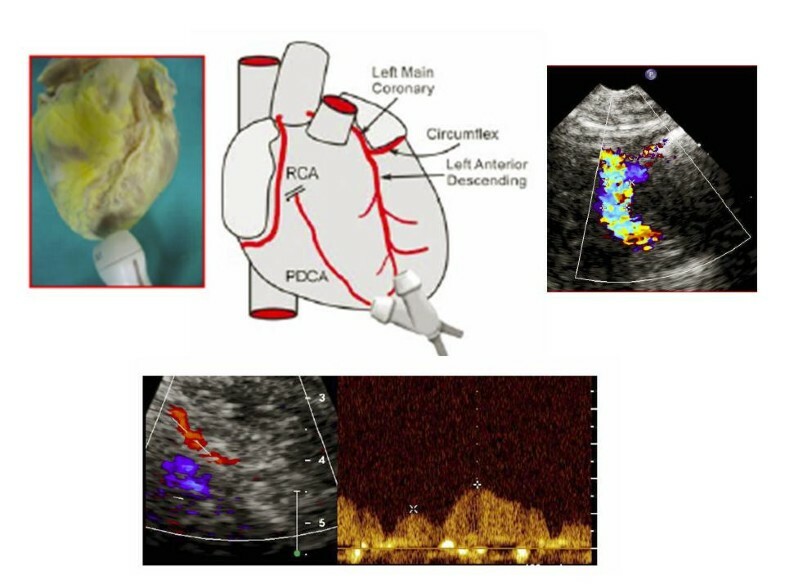 By applying the latest technology, it is nowadays possible to investigate LAD in 98% of patients and PDCA in 60–70% of patients , obviously delivering appropriate ultrasound frequencies for each coronary target such as summarized in Tab 1. A good approach to the two major coronary arteries is made possible only by appropriate setting of the echo machine. To achieve this, it is important to apply the current parameters summarized in Table 1. 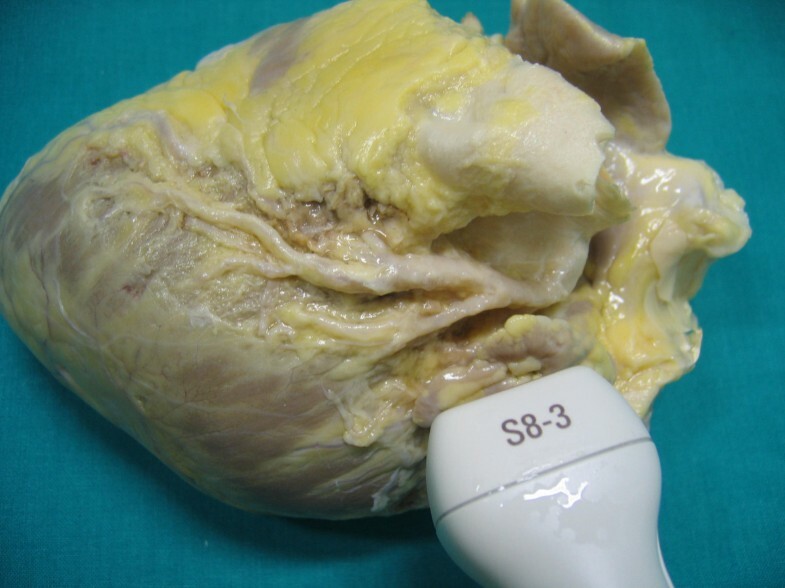 A different application of the transducer exists for each coronary artery, ranging from lower frequencies in evaluating PDCA and proximal tract of LAD and higher frequencies for distal tract of LAD. To obtain correct coronary flow and reserve (CFR), we need to be sure where we address the sample volume and we should be able to maintain the same position during the entire injection of the vasodilator agent. We can use Dipyridamole (0,84 mg/Kg/m' over 6 m' continuously) as well as Adenosine (140 mcg/Kg/m' for 2–3 m' with infusion time depending on operator skills) as a hyperaemic stressor. Dipyridamole is preferable because it reaches the hyperaemic peak induction more slowly and therefore it allows us to simultaneously investigate left ventricle contractility and coronary flow in different tracts of the coronary artery and to obtain a flow reserve in both coronary arteries [1–3]. A lost coronary signal due to poor positioning of the probe during vasodilator infusion, a jumping of the investigation from one artery to another, the presence of pericardial effusion or right ventricular enlargement. A reasonable explanation why this coronary ultrasound approach has not become as widespread as expected lies in the fact that it requires good balance in terms of anatomical and technological knowledge. As a result, a dedicated learning curve is necessary, initially resulting in a significant loss of time. To convince a wider number of operators, we may well need to develop easier technology in terms of feasibility and application. Until recently, a good coronary signal could only be obtained by adopting different multi-frequency probes. Now, with the application of a broadband transducer we can obtain an excellent color flow coronary signal simply by switching different frequencies on a single probe. It is even possible to obtain a 3-dimensional view of coronary anatomy which allows us to focus coronary direction better and, therefore to guide coronary investigation better (Fig 15) [see Additional File 6]. 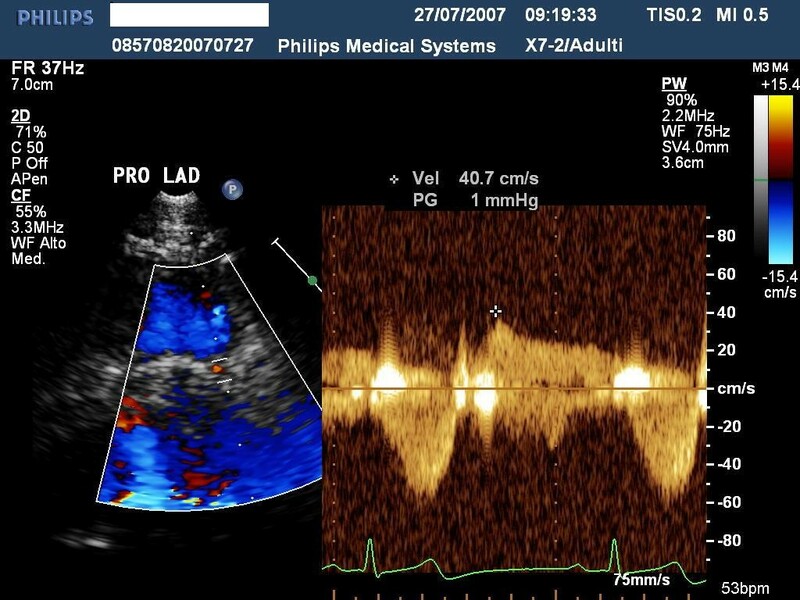 The high quality of Color and Pulse Doppler obtainable with this transducer could facilitate the busy sonographer and guarantee a more objective coronary flow and reserve analysis. shows an example of the distal tract of left descending coronary artery highlights by 3-Dimensional Color Doppler evaluation.